P51A Mustang equipped with four 20mm cannons. This is the version of the Mustang that Waldo and Roseanna fly throughout the book, until the last few chapters when they move on to the newer P-51D. The Mustangs built with this armament were part of a block to be delivered to the RAF, but the Air Corps decided to keep a few and make it up with the next production block. 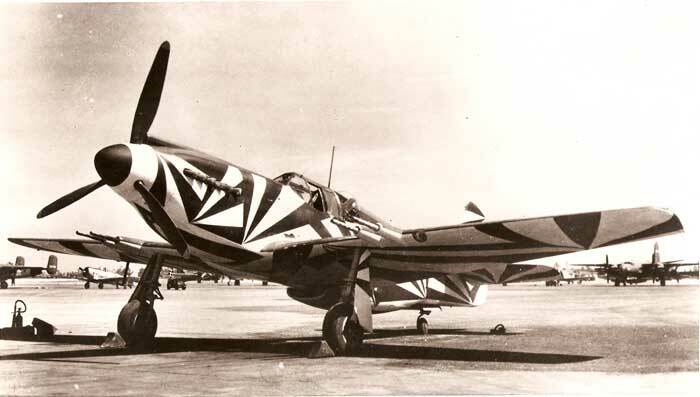 A number of the airplanes went through various experimental fittings…and in case you are wondering, this P-51-NA is painted in a decidedly unique and experimental camouflage scheme…unlike anything depicted in Roseanna’s Reply. This appears to be one of the early Mustangs that hung around the states throughout the war and got tinkered with a lot. Careful examination of the photo will reveal the glass blister right behind the canopy. This was one of the aircraft modified for photo recon and the blister houses a huge, downward looking camera. I’ve had this photo since the early 1970’s and must admit to a lack of knowledge as to its credit. I suspect it is either an official Air Force or official factory photo. My guess is Air Force. I’m sure some well informed reader will be able to add more detail, but I would further venture to guess this photo was taken at Wright Field, even though just about everything in the background is a North American Aviation product including one of only two XB-28 medium bombers visible under the Mustang’s port wing. The early Mustang models did not have a bubble canopy like the later D models so visibility to the rear was poor. This was a distinct disadvantage when someone was on your tail.